WholeHealthNow is excited to introduce Ralf Jeutter as the newest member of our team of top level homeopathic instructors. Dr. Jeutter is a highly respected and well-loved homeopathic educator who is grounded in a thorough understanding of the fundamental principles of Hahnemannian homeopathy. A long-time student and collaborator of Dr. André Saine, Dr. Jeutter has been instrumental in Dr. Saine's ongoing Materia Medica Pura project. 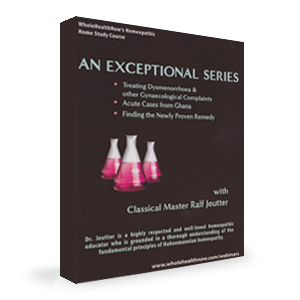 With his dynamic, organized and clear presentation style, Dr. Jeutter is able to impart a profound understanding of homeopathic principles, invaluable for all students, from the beginner to the most advanced practitioner. These sessions will focus on recognising a case with dissimilar diseases requiring two different remedies. We will demonstrate how to recognise a case which needs a so-called “smaller” remedy. Differential materia medica will be discussed in order to enable the student and practitioner to recognise smaller remedies in practice. Case management issues, repetition of dose and other issues critical to successful practice will also be discussed. Acute Cases from Ghana provides an opportunity to see the efficacy of homeopathy in treating diseases such as gonorrhoea, typhoid and other infectious diseases. These sessions will focus on case analysis strategies with different repertories (e.g. Kent derived repertories, Bönninghausen, etc.) and materiae medicae including original sources, such as provings. Case examples from Ralf Jeutter’s time working in Ghana will be presented to illustrate how to treat these types of conditions. Dr. Jeutter will also discuss the potential genus epidemicus for the recent Ebola outbreak and relay the latest updates from four homeopathic doctors working on the front lines in Sierra Leone. Natrum muriaticum is one of our most over-prescribed remedies. These sessions will focus on differentiating between Natrum muriaticum and another new remedy, which is developing into a polychrest in its own right. In these sessions we will look at a case where posology/potency is of prime importance, and another case where a remedy very close to Natrum muriaticum had to be chosen. A detailed differential materia medica will be carried out, backed up by proving data and clinical confirmations including recent repertory additions. Participants will experience first-hand how a remedy comes into being and grows into an important polychrest. My approach to homeopathy is straightforward: avoid all speculation and theorising and concentrate on what the patient presents with. Dr. Jeutter has been involved with homeopathy for over 20 years. Drawing upon his prior experience as a university lecturer, his homeopathy classes are popular in the UK, Hungary and New York (where he is the Head of Academic Affairs at the Centre for Homeopathic Education, New York). It is the genuine Hahnemannian spirit to totally disregard all theories, even those of one’s own fabrication, when they are in opposition to the results of pure experience. All theories and hypotheses have no positive weight whatever, only as far as they lead to new experiments, and afford a better survey of the results of those already made. *To receive Homeopathic Education Hours: You must watch the recorded sessions, and complete all quizzes with a score of 80% or better within 6 months of your enrollment in the course. Please be sure to print and safeguard your Letter at the conclusion of the course. Partial course credit is not given for WHN courses. The Jeutter Sessions are another in WholeHealthNow's ongoing At-Home Learning Series, offering high-quality, affordable homeopathic education.